What you need to understand, however, is that clutter is something you should not hold on to. That is why we will not help you detect the clutter that has been existing in your home under cover. This type of clutter is pretty easy to spot. Those are usually broken furniture, small kitchen appliances or old newspapers and magazines that you have read a long time ago. The only reason they are still hanging around in your house is because you have been actively procrastinating throwing them away. We feel you but there is an easy solution to your troubles – just find a licensed junk removal service in Wapping E1, for example, and let someone else take care of that annoying chore. No one will judge you. If you are a bargain hunter, your home is probably filled with various items that were on sale when you bought them. Discounts are awesome but they are not a good enough reason to buy a product you do not really need. Receiving a Christmas present or birthday gift we hate – we have all been there. The best thing you can do with such items is to return them to the store but for that, you will need a receipt. If you do not have one, secretly regift the gift to someone who actually needs it. An old shirt you wore on your first date with your current partner or a shell you picked up from the beach where you were vacationing 7 years ago – these are some examples of what sentimental junk is. Those are items that have no monetary value and no real purpose. You have always admired people who appreciate art. That is why you have filled your home with various extravagant sculptures, paintings and figures because you want others to view you as an art aficionado. Either become one in reality or get rid of your make-believe clutter. You don’t do scuba diving but you keep a diving mask and a pair of scuba fins just in case you ever go on such a holiday. 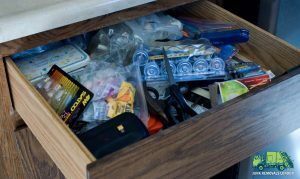 Unless you have already booked a scuba diving vacation, it is time to part with this just-in-case clutter. Find affordable house clearance services in London and kiss all of that junk goodbye.